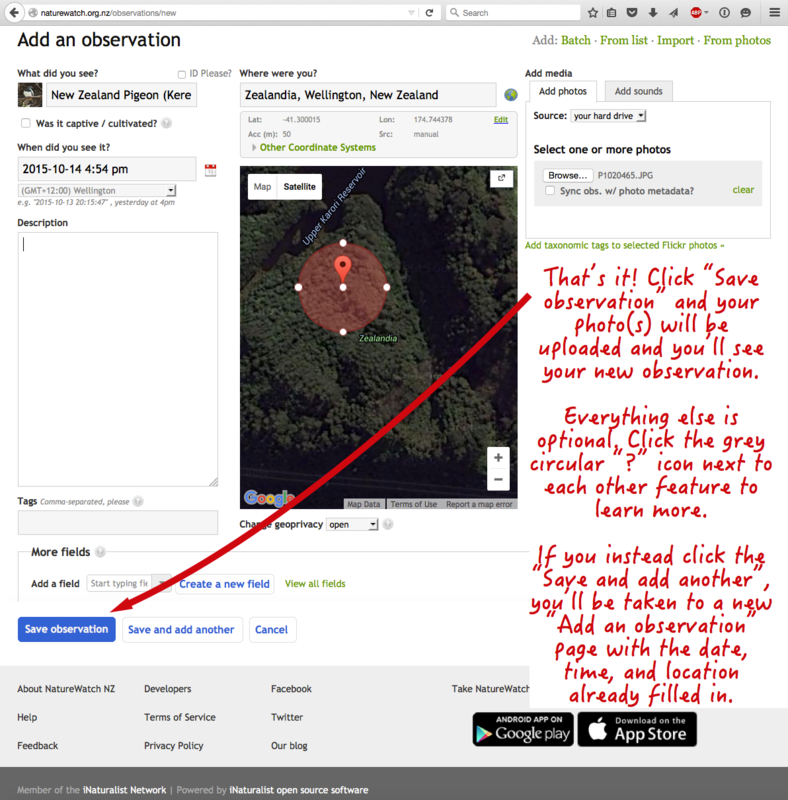 This is our quick starter guide to adding observations to iNaturalist NZ — Mātaki Taiao. You can share your observations of any living thing on iNaturalist NZ. The essentials are to specify where, when, and what, as accurately as you can. If you don't know exactly what something is, the what could just be "Fungi", for example. That's still helpful, as it means that our fungi experts will find your observation when they search for fungi that need identifying. If you're adding photo(s), the iNaturalist NZ community will usually be quick to identify what it is. The accurate when and where come from you (or automatically from your smart phone or camera). The only rule is one species per observation. If you've got several species in a photo, you can upload the same photo as several observations, or we can tag the other species as associated species. Your first choice is whether to use the website or app. You can log in to iNaturalist NZ on the iNaturalist app, since iNaturalist NZ — Mātaki Taiao is part of the global iNaturalist network. The free iNaturalist app, available for Android and Apple iOS, is the easiest way to upload observations if you use your smart phone as your camera. If you use another camera, or wish to access our extra web-only features, then the website is where to go. The first time you use the iNaturalist app, you'll need to log in, using your iNaturalist NZ — Mātaki Taiao account. If you don't already have an account with us, you'll need to sign up first. You can do that directly from the app or on the website here. Once you've done that once, the app will remember you each time you open it. If it asks, make sure to give the app access to your location and photo library. Otherwise it won't know where you are and won't let you select photos you've already taken outside of the app. 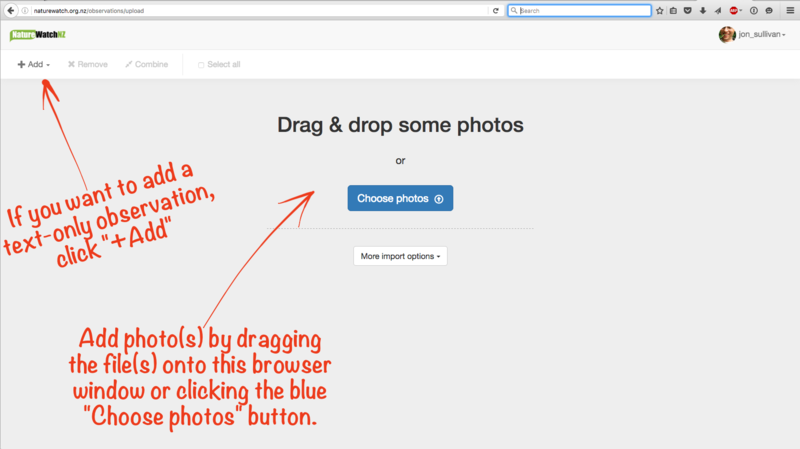 Take a photo (or select a photo from your photo library, or decide to just make a text observation). Fill in whatever details you want to add. Your smart phone will know where and when you are and fill in those details automatically (unless you're on a WiFi-only tablet like many iPads, in which case you'll need to put a pin on the map). Don't forget the upload step. The app lets you make as many observations as you like, with and without mobile coverage, but it won't send them up to iNaturalist NZ until you touch Upload. 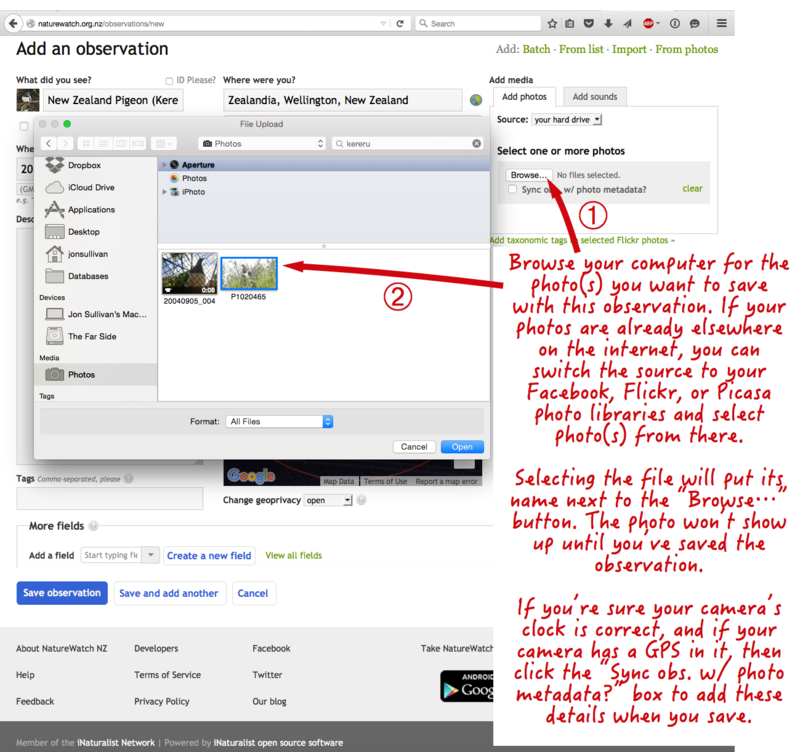 Keep in mind that you can add multiple photos to one observation. Just touch the camera icon again to add another photo. It's quite handy to take an assortment of photos of the different features you see to help someone else ID it, or confirm your ID. If your critter is small or far away, note the cunning trick of holding your smart phone camera up to a magnifying glass or a pair of binoculars. 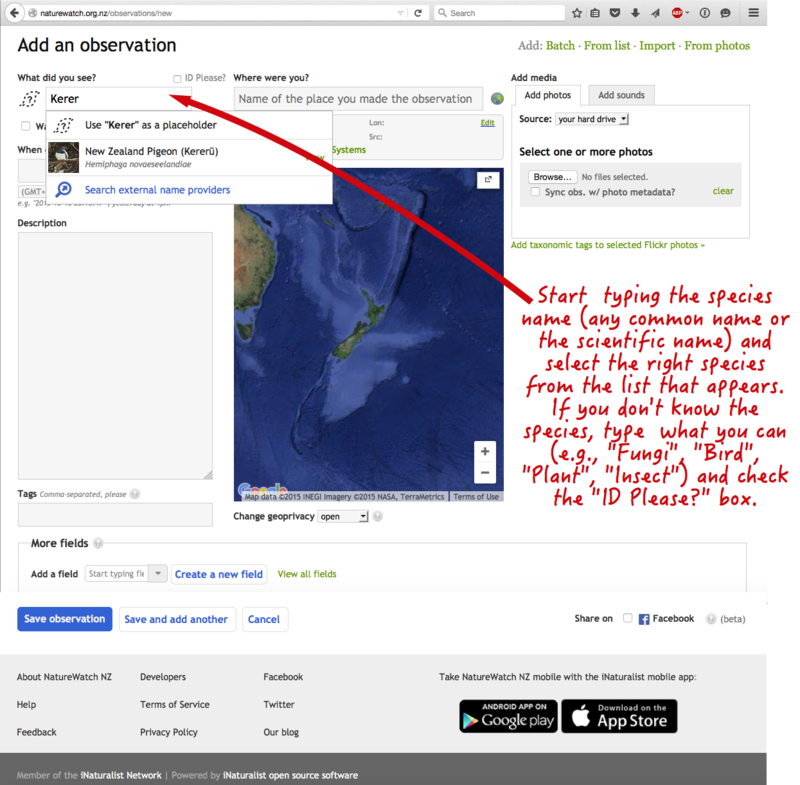 Tony Stoddard of WWF made a handy step-by-step guide to using the app to add a kereru observation, for the 2015 Great Kereru Count. It's got screenshots of every step. Nice! 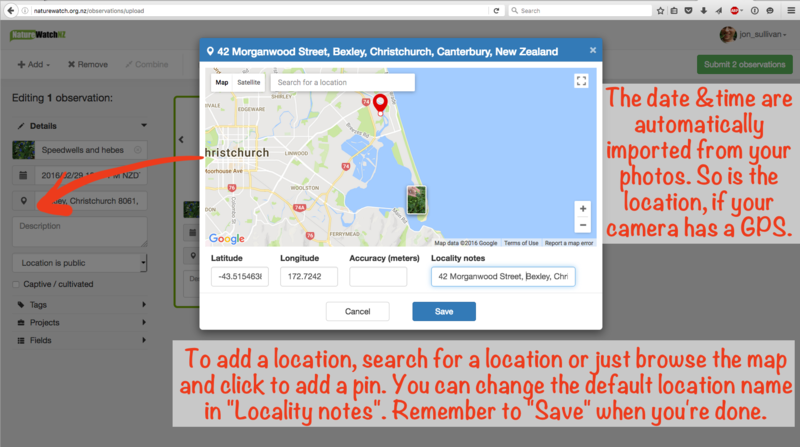 First, make sure that you're logged in to iNaturalist NZ — Mātaki Taiao. If you're logged in, you'll see your user name at the top right of all iNaturalist NZ webpages. You can tick the "Remember me" box to stay logged in if you want. If this is your first time, you'll first need to sign up here. 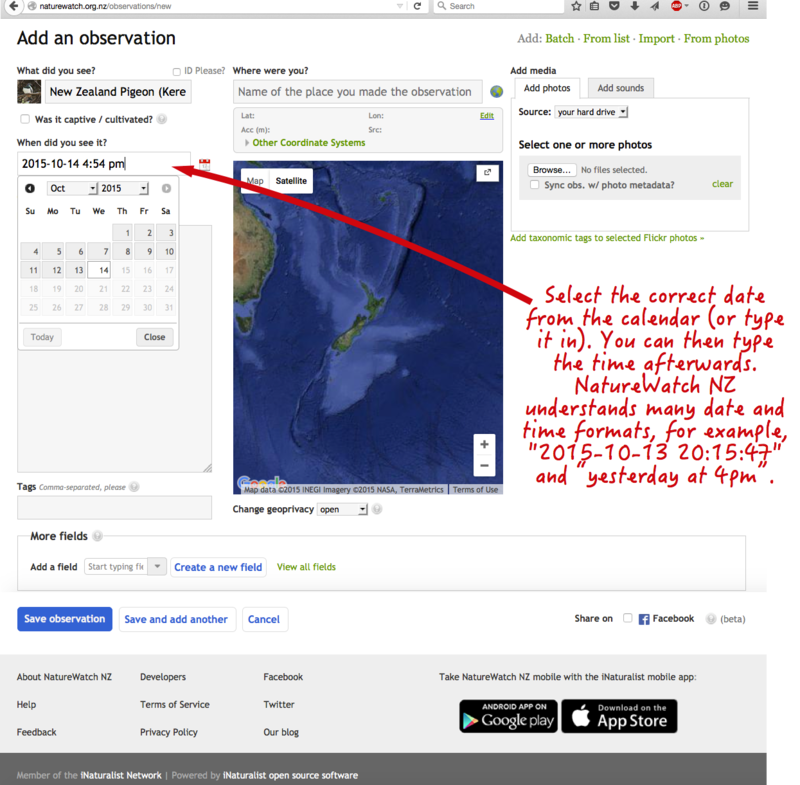 To add an observation, sign in to iNaturalist NZ — Mātaki Taiao and click the "+ Add observations" button. If you're already signed in and exploring elsewhere on the site, click your name in the top right corner of any page and choose "Add" under "Observations" in the drop-down list of options. This takes you to the Add an observation page. Here's where all the action happens. You can now enter as much or as little information as you like. The essentials to get right are the Where were you?, When did you see it?, and What did you see?. Where, When, What. Here are some screenshots to walk you through the essential steps. When you add an observation, under the big blue "Choose photos" button, there's also a button called "More import options". 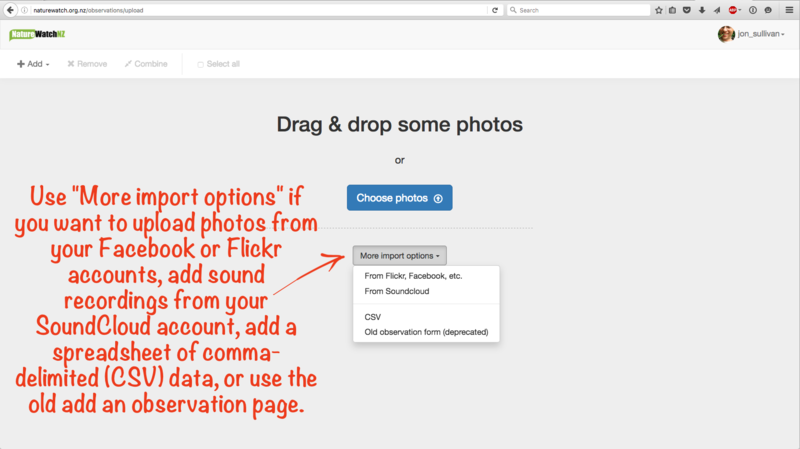 Here you'll find options to upload photos from your Facebook or Flickr accounts, sounds from your SoundCloud account, a spreadsheet of data in comma-delimited CSV format, or you can choose to use the "Old observation form". The old observation form is how we all used to add observations before the clever team at iNaturalist dreamt up an easier way to do it. 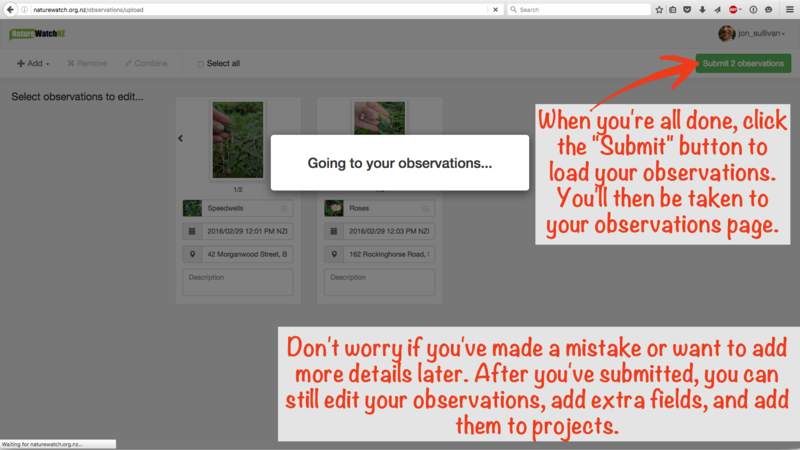 For the old school users out there, the following screenshots walk you through the essential steps for adding observations via the old observation form. Once your observation is on iNaturalist NZ — Mātaki Taiao, you'll start getting other users adding their identifications to it and perhaps leaving some helpful comments. You can see all the activity on your observations on your Dashboard. On the app, observations with comments and IDs you haven't seen will be flagged with a red number (that's the number comments and IDs have been made on that observation). 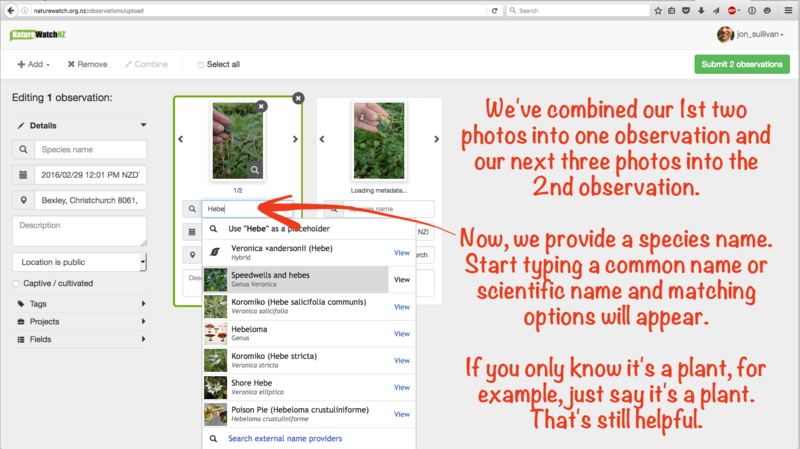 Don't be surprised if other users also add your observation to Projects on iNaturalist NZ — Mātaki Taiao, or add extra fields to your observation that can make it more useful to researchers. 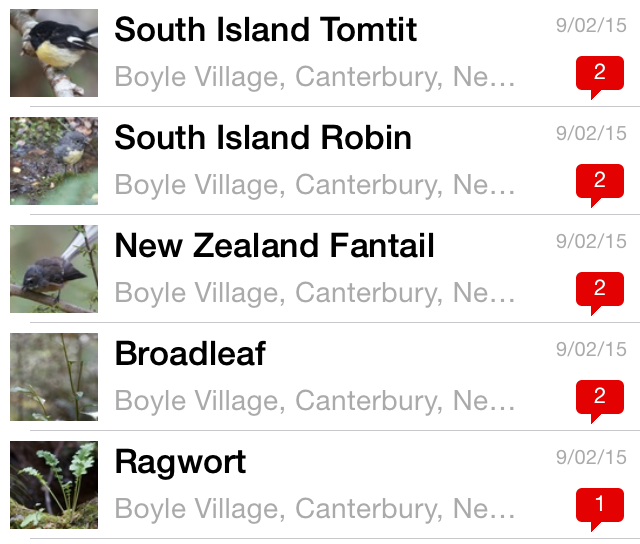 There are lots of Projects in iNaturalist NZ dedicated to gathering together particular kinds of observations. Extra fields are things like life stage, associated species, and reproductive state (like whether a plant is flowering). 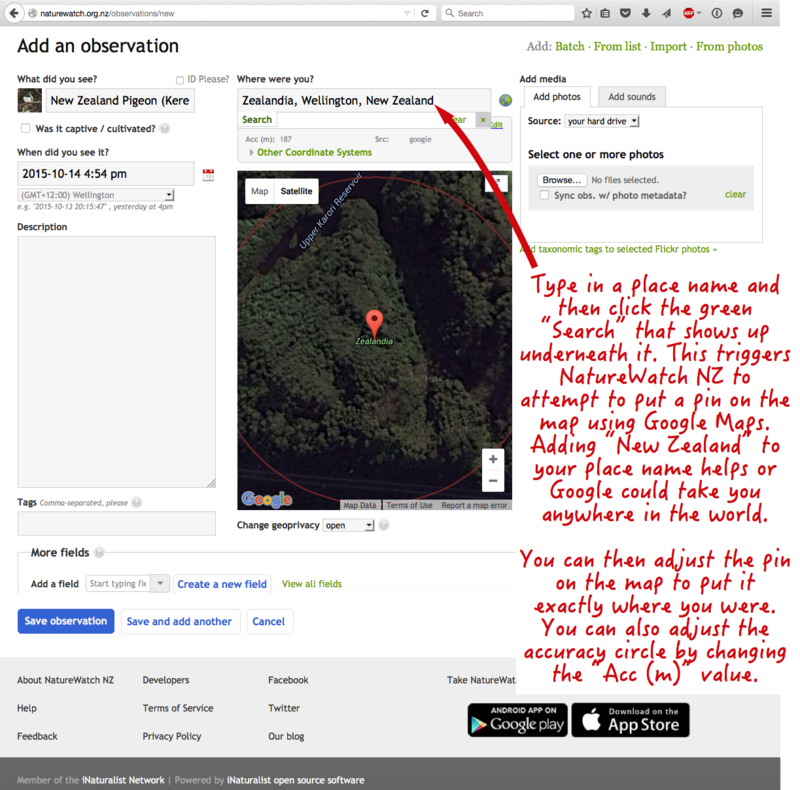 You can also add extra field information to your observations. See here for details. 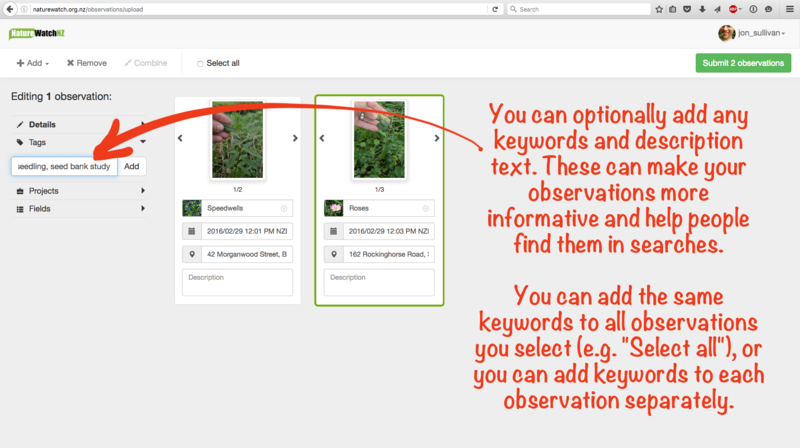 We've only covered the essentials of adding an observation via the webpage. There are other features there too for power users. Import lets you upload lots of observations at once from your photo library on Facebook or Flickr, or you can bulk upload a whole spreadsheet. 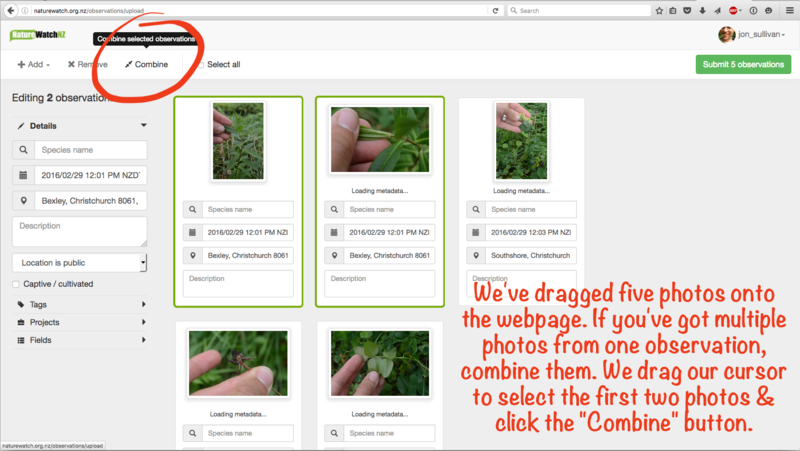 From photos lets you upload lots of photos at once from your hard-drive and iNaturalist NZ will look inside the file info of each photo for the date, time, location (from a camera GPS) and any recognisable species names added to the photo metadata.